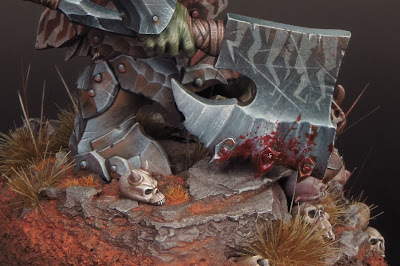 Ironjaws Megaboss part 11- Blood and yet more blood! In truth I’ve not added much extra blood to what was there before but I’ve reworked it to look a bit more bloody. I realised that I had botched my blood mix and used red ink instead of Tamiya clear red. I think the Tamiya makes a huge difference – it’s mixed with GW’s Bardab Black wash. I also repainted the neck stump on the Dracoth to bring out the sculpted detail. I think it looks a lot more ‘meaty’ now and I’m very happy with the result. So I’ve got a Megaboss with what amounts to one base stuck onto another and a dirty great gap between them! Obviously I had to fill in the gap with a texture that would blend seamlessly into the existing base work. The problem is that the earth texture was made at the start of the project using garden soil and superglue. This gives an excellent result but there is no way I’d risk it on a painted mini. The fumes given off by superglue can cause white fogging on painted surfaces. I decided to experiment with Games Workshop’s texture paints and I’m very glad I did! I invested in a few pots and tried out various combinations. 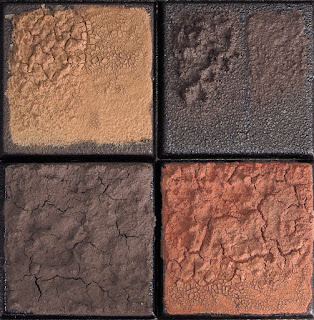 In all cases I found that the results were excellent! Each type of paint behaved as promised and the final results were both stable and easy to paint onto. Best of all I could detect no signs of shrinkage, which meant I could use the texture paint to fill the gap. I decided that Stirland Battlemire was the best option for my Megaboss and, sure enough, the final texture matches the pre-existing texture very well. Like other Games Workshop products, these are not the cheapest option available; but the ease of use and finished quality mean I’ll be making the texture paints a regular part of my basing kit. I’m impressed! With the gap filled and the base now a seamless whole, I had just a few little touches to attend to. Although the scene calls for a certain amount of blood and gore, I’ve decided to keep it to the minimum. 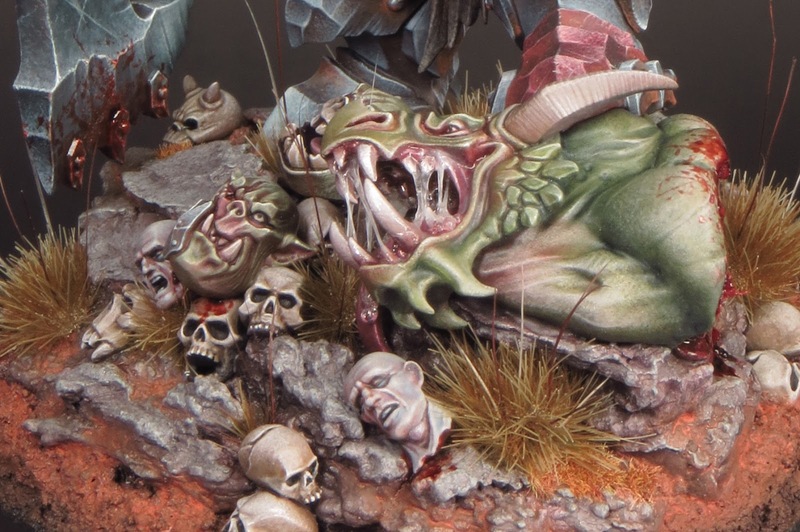 With all the severed heads it would not be inappropriate to produce a version of this model that was literally blood drenched, but that’s not what I want. For one thing, in my mind, the heads were not severed at this spot but brought here from elsewhere and have had most of the blood drained out of them on the battlefield. More importantly, I didn’t want an over-the-top gory feel to this piece as I think that would be distracting from the overall composition. However, I did decide to add a little more blood hear and there. Not least to the Dracoth’s neck as the cut was just a little too clean. With the Megaboss now done, except for a plinth, it’s time to put him away in the cabinet for a while. I always like to do this with a newly ‘finished’ mini as I’m far too close to the project to be able to view it objectively at this stage. In truth, I’m sick of the sight of the Megaboss at the moment but that’s a symptom of the ‘fatigue’ I’ve been feeling with this project and a little time away from it will do the world of good. But, I’m very glad I persevered and finished it! The reveal of the finished Megaboss will have to wait for a while until he is mounted on a plinth. My immediate priority is the upcoming workshop in Copenhagen and I’m preparing a few bits and pieces in readyness for that. However, my next painting project is also underway. I can guarantee that it is unlike anything I’ve ever painted before! It’s been a long time coming but the end of the project is finally in sight! 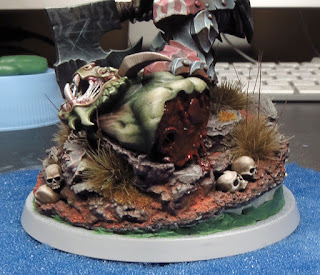 In order to finish the Megaboss I had to complete his base and that was quite a project in itself. 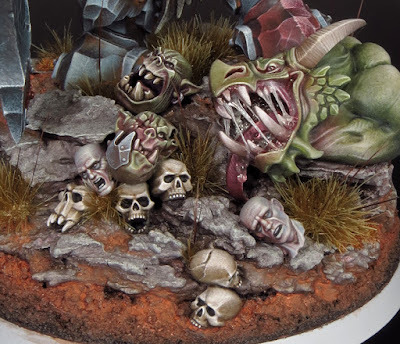 As well as the severed dracoth head there were several skulls attached to the base, but they were not going to be the only such additions. I intended the base to be piled up with severed heads, using a mix of Orruk and human heads, as well as a couple of more skulls. 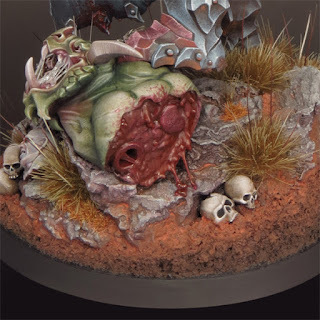 This would give the base a look of a trophy mound with the combination of skulls, and more recently severed heads, telling a story of many victories over a period of time. Painting the heads went very smoothly, although it was very fiddly work. 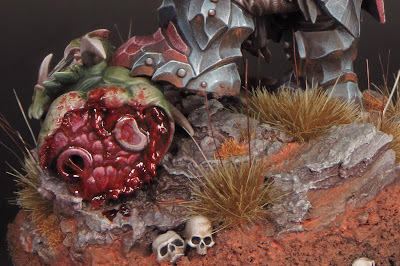 The desaturated flesh tones I have used on the severed heads helps to convey the impression of death and prevent them from drawing too much focus from the Megaboss. For the same reason, I put a little more work into the dracoth head to darken and desaturate it. Once the heads were painted, I glued them onto the base using PVA woodworking glue. This is an excellent adhesive for small lightweight parts that do not need to be held in place while the glue dries. It avoids the potential mess of epoxy glue, and the problems of fogging and positioning that can come with superglue. With PVA, parts can be nudged into place and any excess can be cleaned away with a clean damp paintbrush. Then it was time to add a few sparse grass tufts and, after the addition of a little extra dirt effects, the Megaboss would be finished – or so I thought! I’d been having those nagging doubts I sometimes get. This time I felt that something wasn’t quite right with the Megaboss but I couldn’t put my finger on exactly what the problem was. It might just have been last minute jitters, as the project came together, but the feeling got stronger and stronger. The answer came from sitting back and taking a good long look at the model. All the details were as good as I could make them but the overall impression lacked impact. 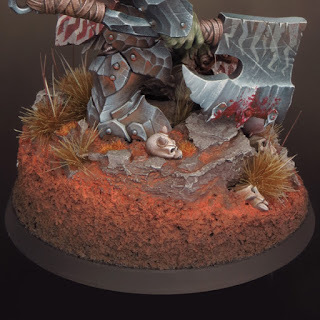 Something was off with the positioning and composition of the Megaboss on his base! He looked very awkward from certain angles and from others seemed to be about to topple backwards, right off the rear of the base. Cue panic, swiftly followed by black despair! However, all was not lost! I could remember a similar situation with my Dark Eldar diorama. The solution, which came as they often do in the middle of the night, was the same as before. I would have to remodel the base. This was not something I undertook lightly and it took several hours to psych myself up to it! If I got it wrong I’d be in a much worse position than before. To begin with I used a pair of clippers to snip away the edges of the plastic base and some of the ‘soil’ from the lower edges. Next I took my Dremmel and sanded away the milliput from under the front edge of the base. This covered the entire model in a heavy layer of milliput dust that had to be meticulously cleaned off. It was, to say the least, a horrible job; but at least I could then move on and start reconstructing the base. I took a new 60mm plastic base and filled the underside with milliput for weight and stability. Once this hardened I glued the old, trimmed down, base onto it. But I didn’t glue it down flat. Instead I inserted a wedge of cork between the old and new bases at the rear. This had the effect of raising up the back edge of the base and radically altering the relative angles of both the Megaboss and the ground. The gaps were then roughly filled in with green stuff. The change has made a massive difference to the Megaboss and his base! The positioning and composition now feel right to me. But the biggest change is that the Megaboss now feels ‘alive’! His posture looks balanced and dynamic and this, together with the added height, has given the piece much greater impact. 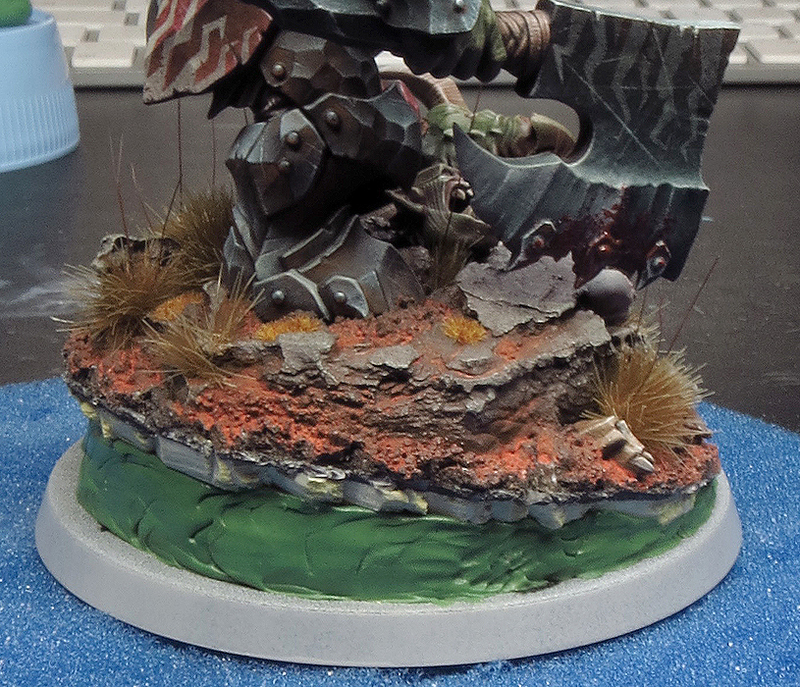 Now I have to reapply and paint the soil effects but the end really is in sight … honest.